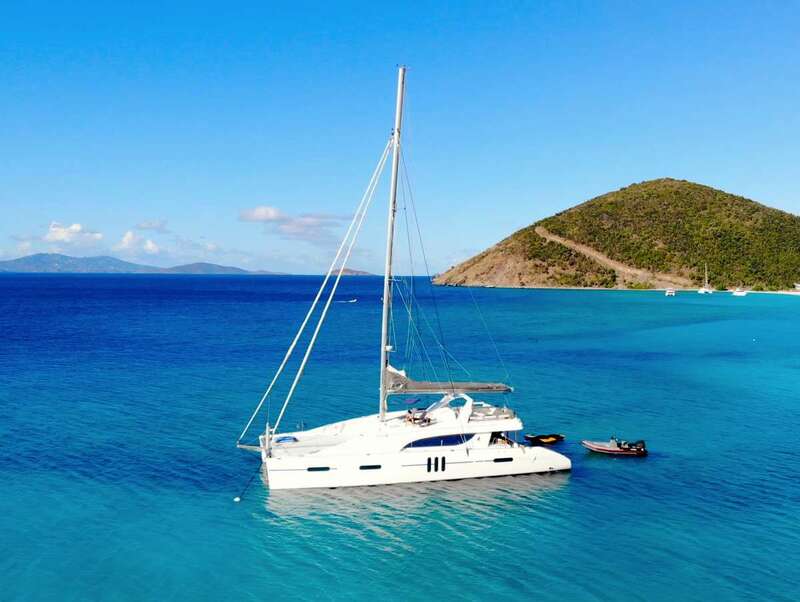 Catamaran Tranquility is a 2013, 76' Matrix catamaran offering crewed yacht charters in the BVI, USVI and the Grenadines. 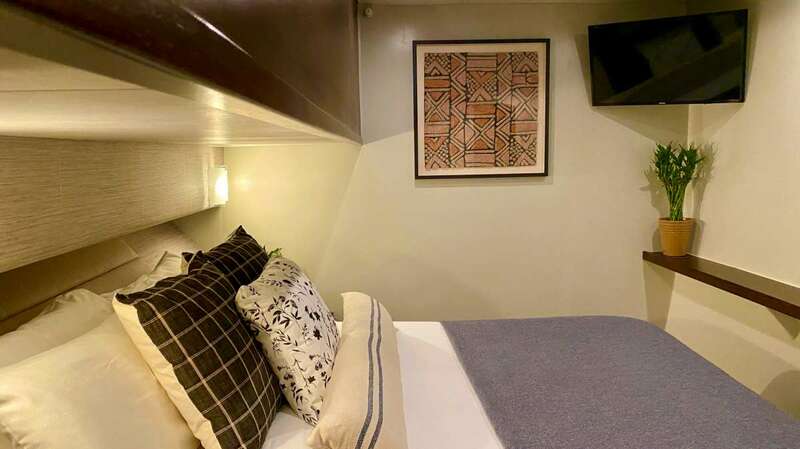 She features a fly-bridge deck, top-notch Chef, on-board scuba diving and instruction, and accommodations for up to 12 guests in 1 Master King cabin, 3 Queen cabins, plus 2 side by side Twin cabins. 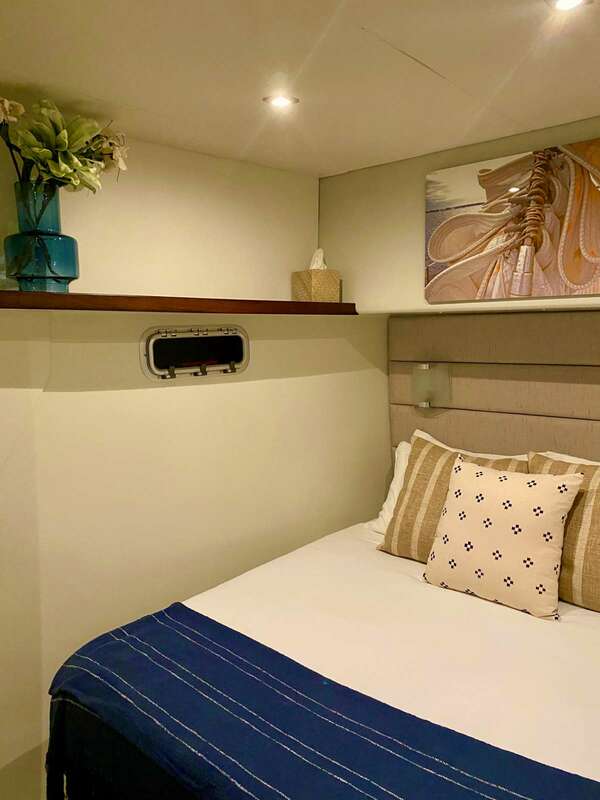 Catamaran Tranquility is a Carefree Yacht Charters high-end, exclusive selection for families, couples, divers, foodies, or special occasions. 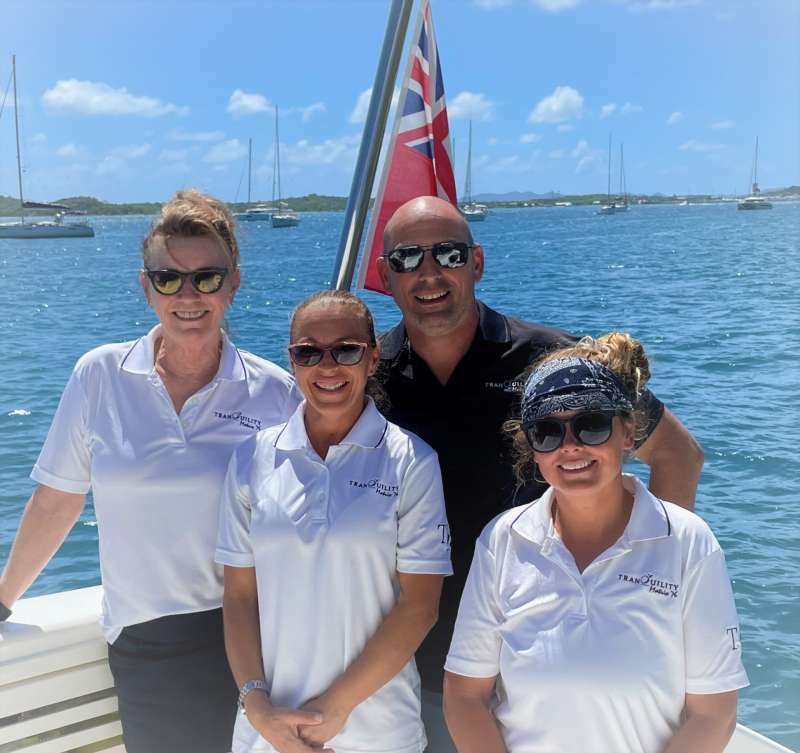 Here's what Patric & Mary told Carefree Yacht Charters about their service style and favorite locations: "Casual silver service ... Well, we are as casual or as formal as guest would like us to be.. Its their holiday.. we'll adapt! 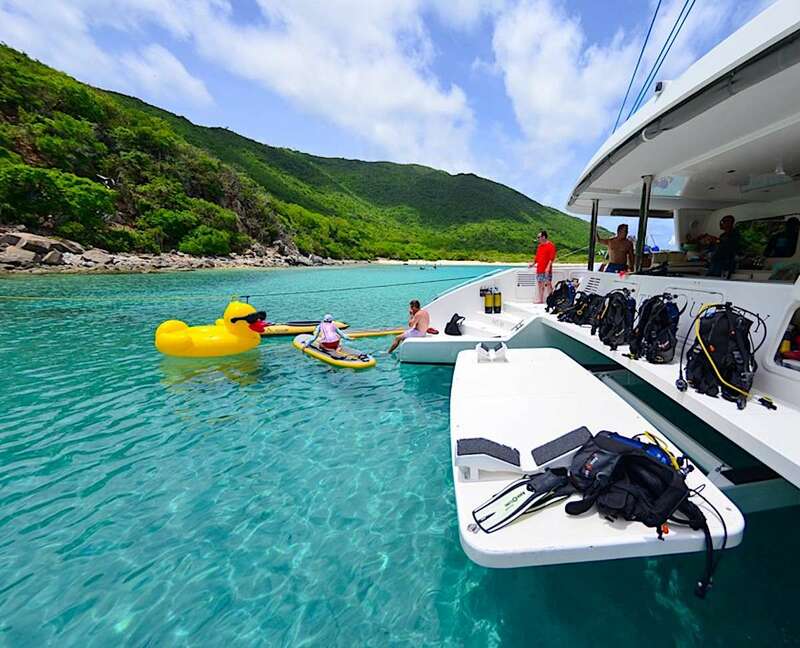 Having charter extensively throughout the Caribbean I truly don't have favorites.. All of the cruising areas have gems, challenges and opportunities.. 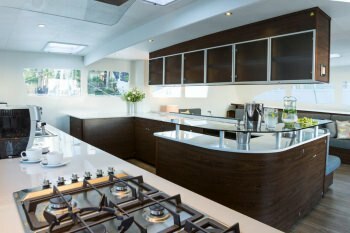 The real trick is to match the guests with the right location." 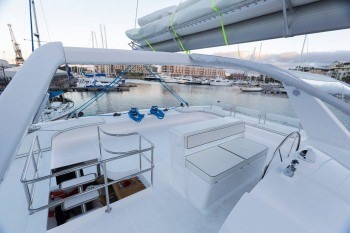 Rates from $46,950 to $54,950. View availability and rate details. 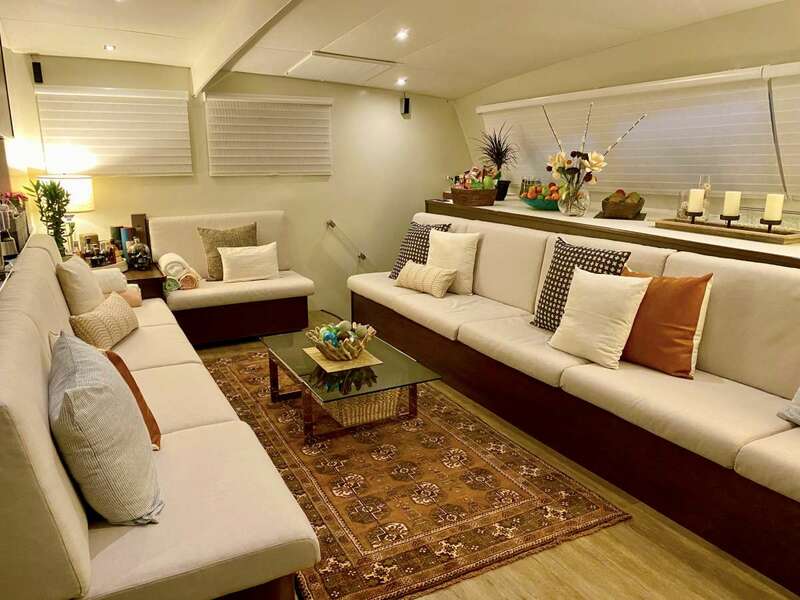 To learn more about this crew or for further details about TRANQUILITY, call us in our South Florida office at (954) 980-9281, toll free at (888) 670-6884 or fill out our Quick Request Form. 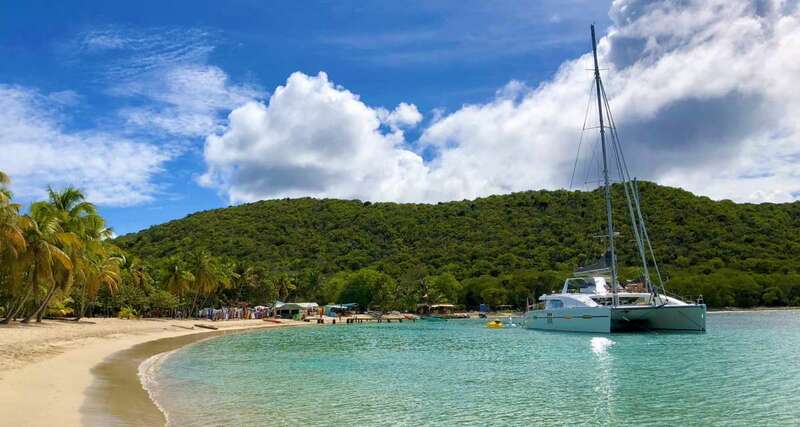 Location Details: BVI for late October through into early July (and down island on request) Early July through August - Grenadines. 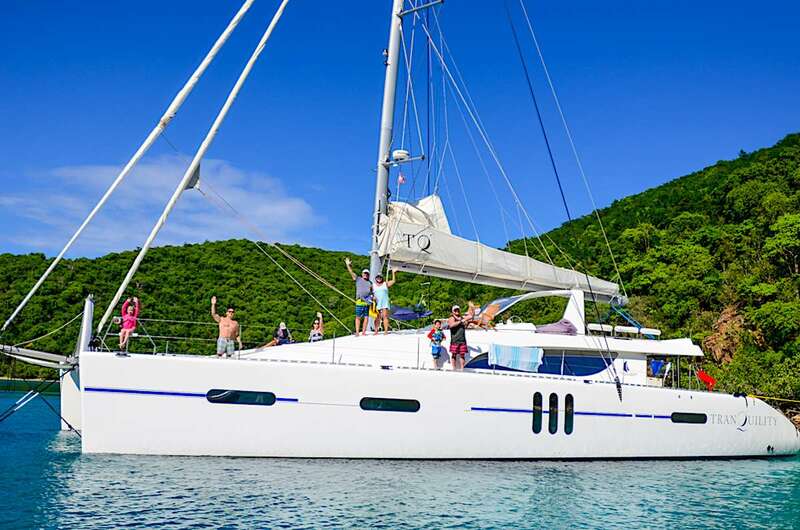 Plus $500 each way for USVI ports 7 nights minimum charters please - No Short Charters without captain's prior approval. 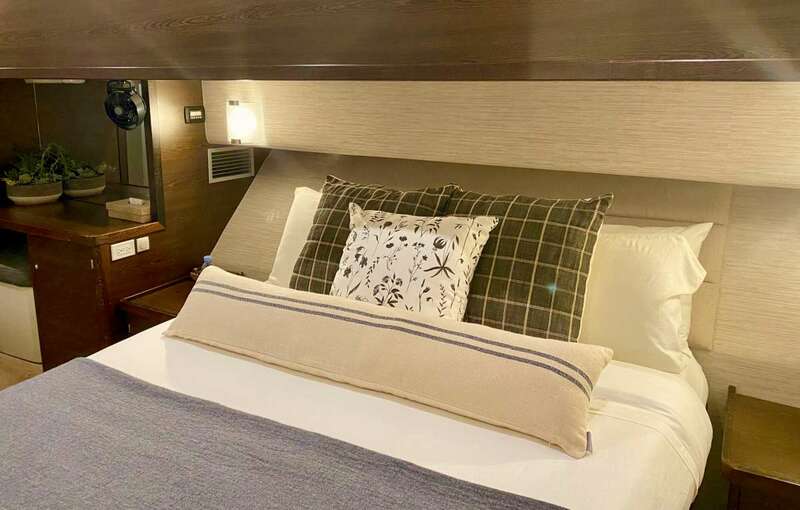 Christmas Week: up to 12 guests - $75,000 New Years Week: up to 12 guests - $85,000 Charters outside the Virgins: Regardless of whether or not a vessel may or may not include taxes in the vessel's listed charter fees for Virgin Islands charters, in general, no fees, port dues, nor taxes are included in the charter fee for any charter outside the Virgin Islands unless otherwise agreed. 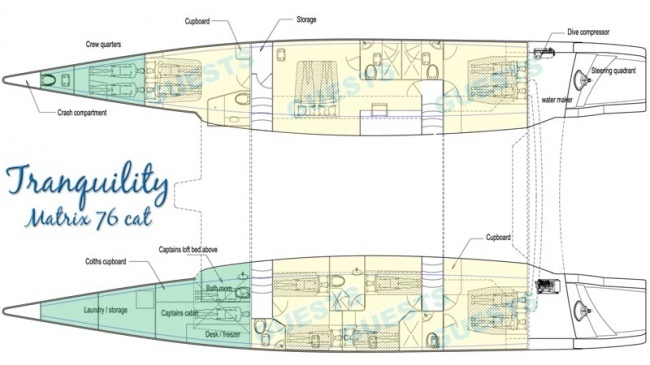 Other Toys: Tranquility features a huge aft platform between the hulls that will raise and lower the dinghy, but can also do the same for 10 divers, or allow a group to use it as a resort shelf for sitting in 6" of water in chairs, sort of bringing the beach to Tranquility! It will be similar to a "resort shelf" on a pool. Mary is a gourmet chef (even though Patric said she's a cook - Emoji). The quality of the food, the preparation, the presentation - all superb, and comparable to anything offered at a top-rated restaurant. This was the case with every meal! We were blown away and each meal we said 'it can't get better,' but it did. 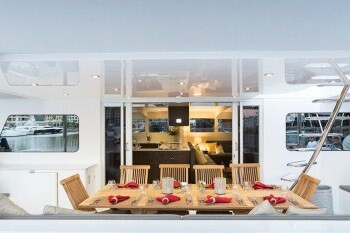 We thought we'd dine on shore one or two nights but soon realized there would be no way to get even close to the quality of the cuisine on board. We had a wonderful trip! 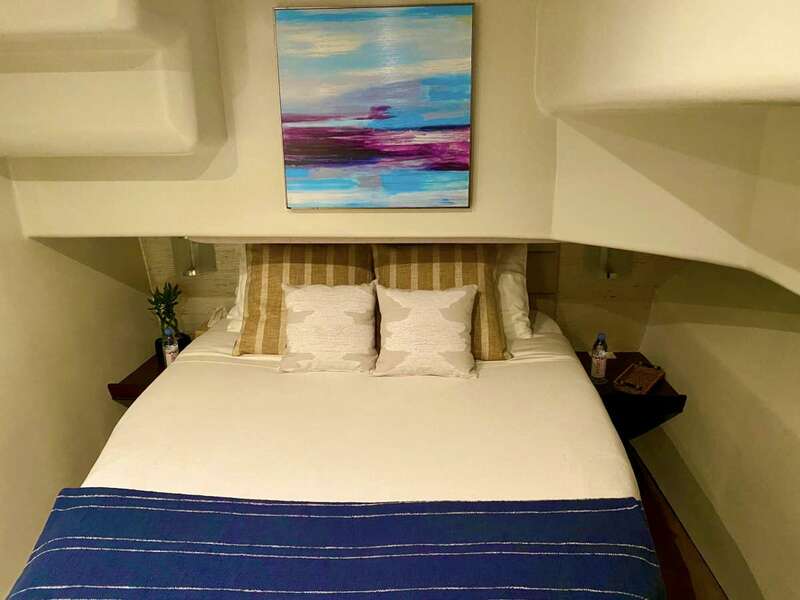 The experience was great - the itinerary, the boat and the crew were all wonderful! We were very well looked after and it was one of the best vacations of our lives. To be honest I do not have much in the improvement category as the experience was really good overall. Happy to receive the newsletter! Thanks Lynne. Happy New Year to you too! 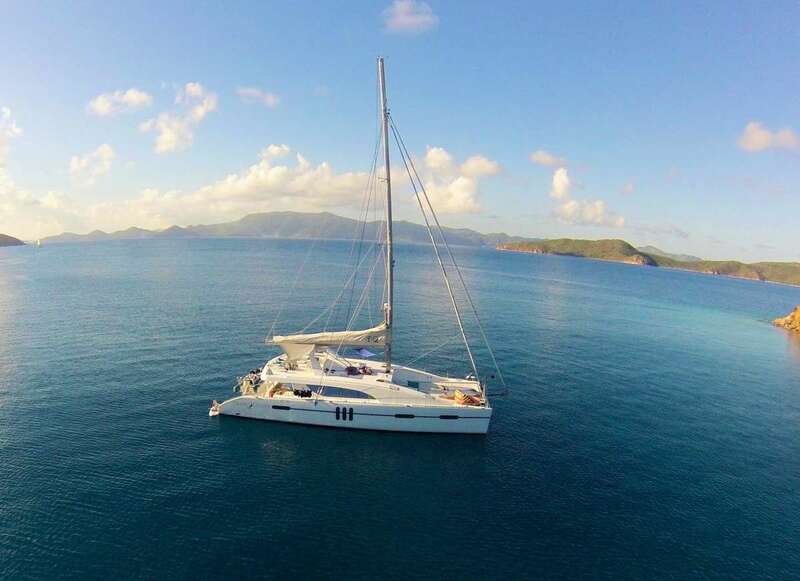 Comments on charter: The crew, the yacht, the food, and the BVIs were all fantastic. We can't say enough about Mary's cooking--yum on every meal! She took great care to ensure that all food allergies and preferences were met. The entire crew of Patric, Mary, Fran and Dave were very service oriented and also fun to be with. We had lots of laughs and good discussions. All the activities, moorings, and sailing suited an active group like ours. Even watching a couple movies at night or listening to music as we did yoga in the morning was well conceived. 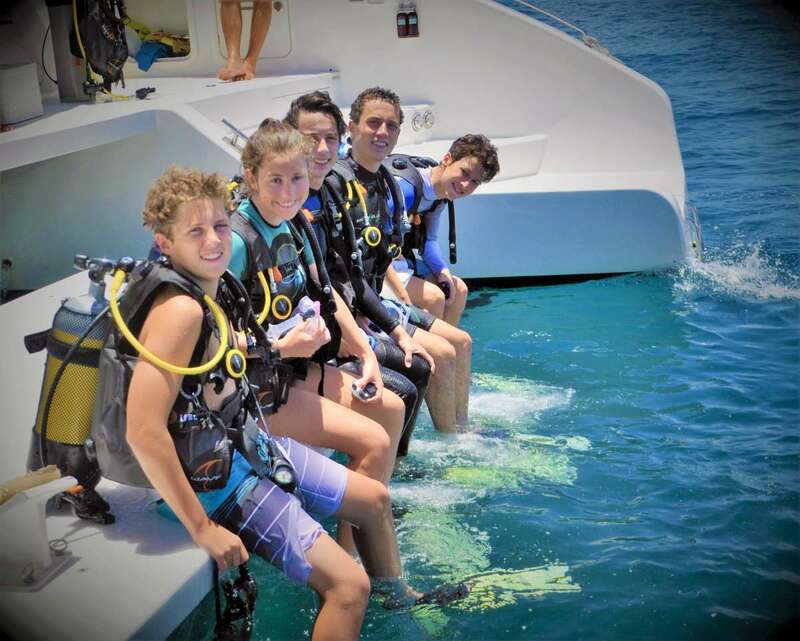 Our charter experience was amazing in every respect. Re Carefree, I really did appreciate the quick follow-up from you and the online preferences form. It made it very easy to send information efficiently. Thank you.